Editor-in-Chief: Olga M. Nuñeza, Ph.D.
JMDS is a peer-reviewed multidisciplinary journal publishing original research articles that cover a wide range of topics. Authors are cordially invited to submit papers for the upcoming Volume 8 of the journal. Original submissions (full paper) must be made via email at journalmds@gmail.com. The email must bear the subject line “JMDS - Paper Submission”. Manuscripts submitted to this journal are unpublished works, not currently under review by another journal. Since the journal adopts a double blind peer-review process before the papers are published to ensure the quality of publication and to guard against plagiarism, authors should submit the manuscript early for timely review of the paper. The topics include biological sciences, chemistry, physics, earth science, agriculture and forestry, environment and health, mathematics, engineering and technology, education, economics, history, cultural studies, language and linguistics, communication studies, political science, law and governance, psychology, gender studies, sociology, criminology, business and commerce, maritime studies and other studies that are multidisciplinary in nature. JMDS requires conformance to the manuscript template that can be downloaded from this link. The authors shall also read the Guide for Authors for the details. Once the manuscript is accepted for publication, the authors must accomplish and submit the copyright transfer document to JMDS via email. The copyright form is available from this link. Authors are responsible for ensuring that their papers do not infringe any existing copyright. If previously copyrighted material is included, authors must provide evidence that the copyright holder has given permission for its use. 1. The article has not been published in any journal. 2. The manuscript is recommended for publication by two peer reviewers. 3. The manuscript has passed the plagiarism detection test with a score of at least 80% for originality. 4. The manuscript has passed the Grammarly checker software with a score of 100. 5. The article exhibits relevance and novelty of topic. 6. The paper is based on rigorous academic standards. 7. The paper meets all applicable standards for the ethics of experimentation and research integrity. Authors will have a free copy of the article as portable document format (PDF) file. Authors are permitted to print unlimited copies of their articles. 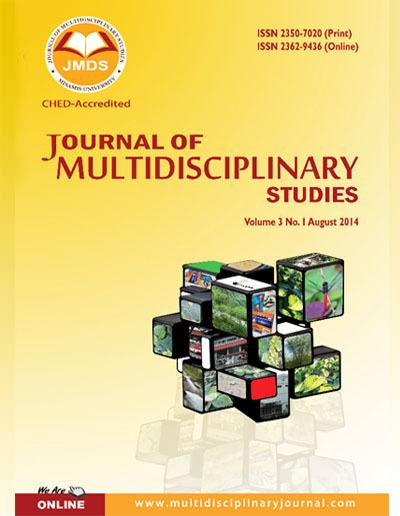 Publication for accepted article in JMDS is free of charge.